No photo gallery of mine would be complete without a pic of my girl, Luca. 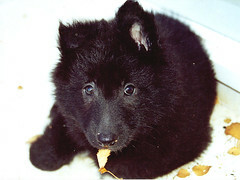 She is my (now) 10 ½ year old Belgian Shepherd (Groenendael). She has been my constant companion for that whole 10 ½ years, as she was assigned to me even before she was born. I held her at one day old, and she came to live with me at 8 weeks. Luca is my first dog – we had a family dog – Mincie – when I was growing up, but I was never really very close to her for some reason. Whereas Luca is my girl. She is by my side now as I type, and is often found close-by. She greets me when I come home with bounds and squeals of delight. She plays like a puppy still, although she has slowed down considerably in the past year or so. She loves the beach, and is pretty good off-lead, apart from stealing other dogs’ balls!